Outside it was some rain in the air, still a lot of people were out walking. Some under their umbrellas, other braving the weather. Hoping the rain would pass soon. Out drinks were served quickly, wine for me and beer for my friend. We leaned back in our seats, enjoyed the beverages, the chance to sit down. It had been a long day, we had been walking for hours. It was nice to sit down for a change. Founded in 1997, originally as a single pizza restaurant, Cili Pizza has since then diverisfied and expanded their operations. The first restaurant opened in Vilnius in Lithuania, today the restaurant chain is open in five countries, and included pizza restaurants, traditional Lithuanian restaurants, chinese restaurants, coffee shops and drive-ins. 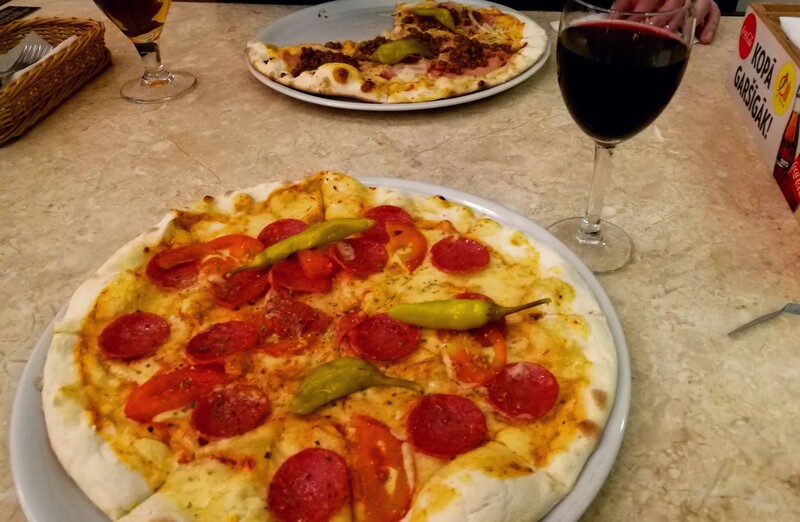 The pizza restaurants offer a quick and tasty meal for a small price, accompagnied by your choice of beer, wine or softdrinks. When I noticed Cili Pizza in Riga I knew I had to visit, I remembered the place from the year before in Vilnius. I had been there a few times during my visit. My friend had also been in Vilnius last year, he had just as good an impression of the restaurant. We planned for an early dinner before heding to a bar for the final party of the weekend. I had heard rumours of 2-4-1 cocktails, it was important to stock up on food beforehand. A the rest of our group found other restaurans, some headed back to the hotel for a quick rest, we found the nearest Cili Pizza restaurant. It did not take long before our pizzas were served, they were as delicious as I remembered them from Vilnius. A delicious crust, great toppings. All cooked very well. We dug into our food, ate in silence. No time for talking when enjoying a tasty pizza. After a few more glasses of wine, the pizza was finished. We paid our bill, headed for the bar where the final party was. So hard to find good pizza outside of NYC but this looks promising!! I love pizza!